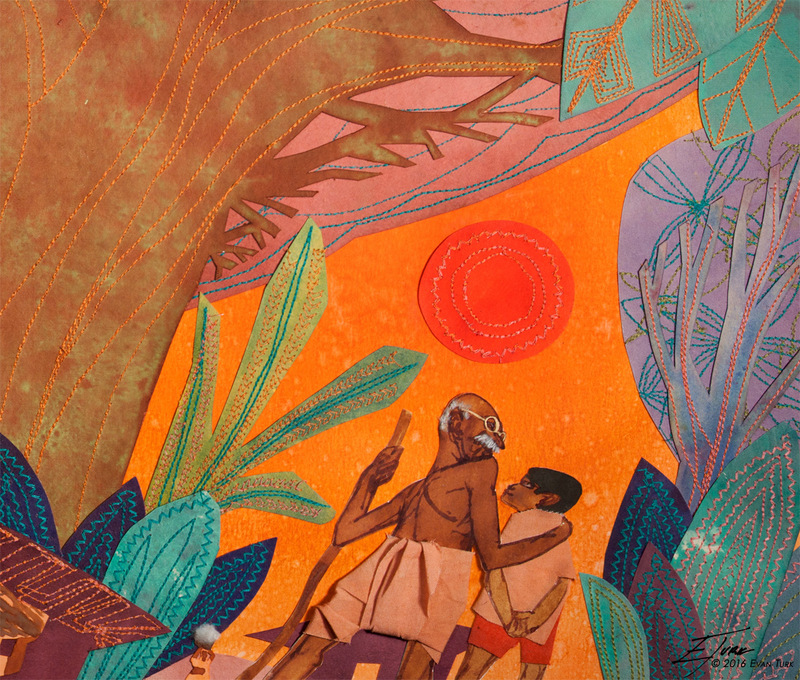 I am so excited to announce the release of the companion book to Grandfather Gandhi, Be The Change: A Grandfather Gandhi Story. I was so thrilled to go back into this world and illustrate another beautiful lesson, this time about how our actions have repercussions and our power to change things for the better. Arun, the grandson of Mahatma Gandhi, lived with his grandfather for 2 years in adolescence, and these two books have been "crystallizations" of lessons he learned during that time. 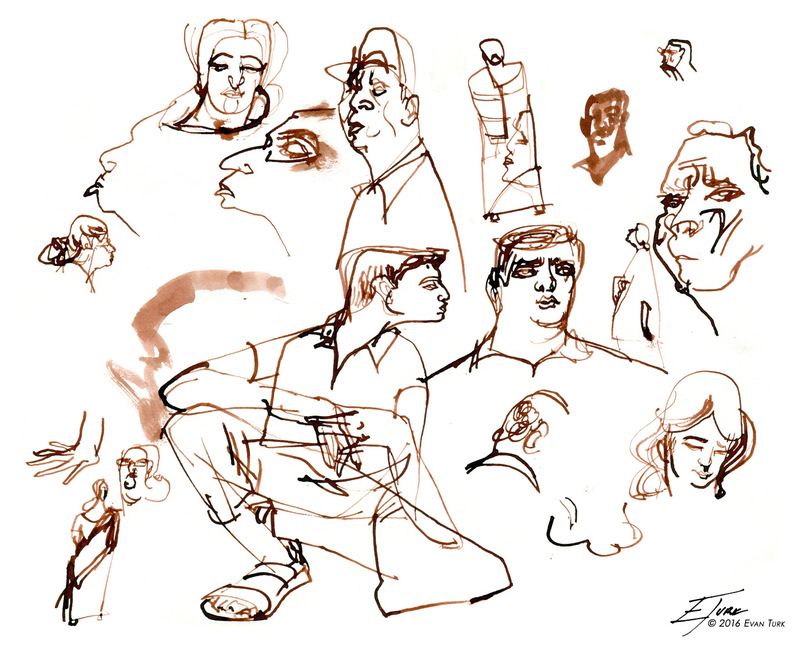 My first step for a new project is always drawing people, so I went to the South Asian part of my neighborhood, Jackson Heights, to draw people and observe their body language. 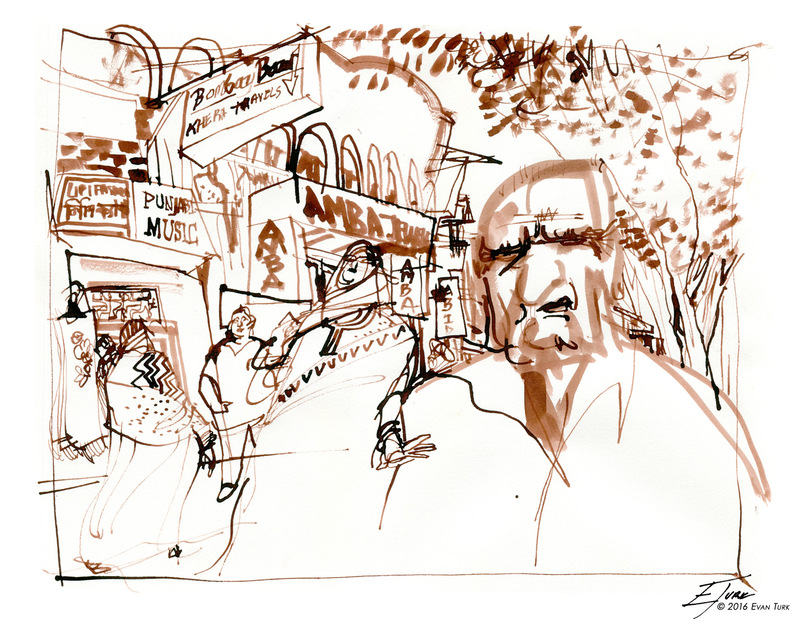 It's always exciting for me to be able to try and transport myself to another place and time for a project, and nowhere is better for that than the many different neighborhoods of New York City. I had a fun time chatting with this boy and his sisters from Bangladesh, who reminded me of Arun and his sister Ela in the book. 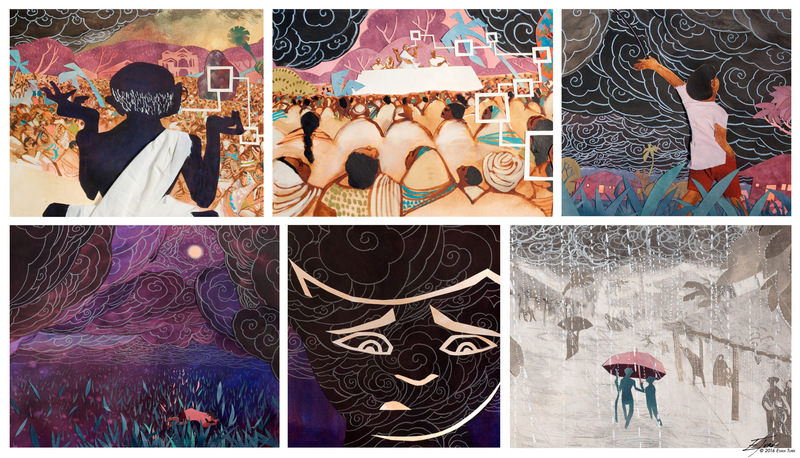 Since I was working in a similar style to the first book, I wanted to find a way to introduce new symbols and visual elements that tell this particular story. Much of the book focuses on Arun's confusion regarding his grandfather's lesson that "waste is a violent action." This confusion comes into the illustrations in the form of the swelling black monsoon clouds that begin to dominate the pages. 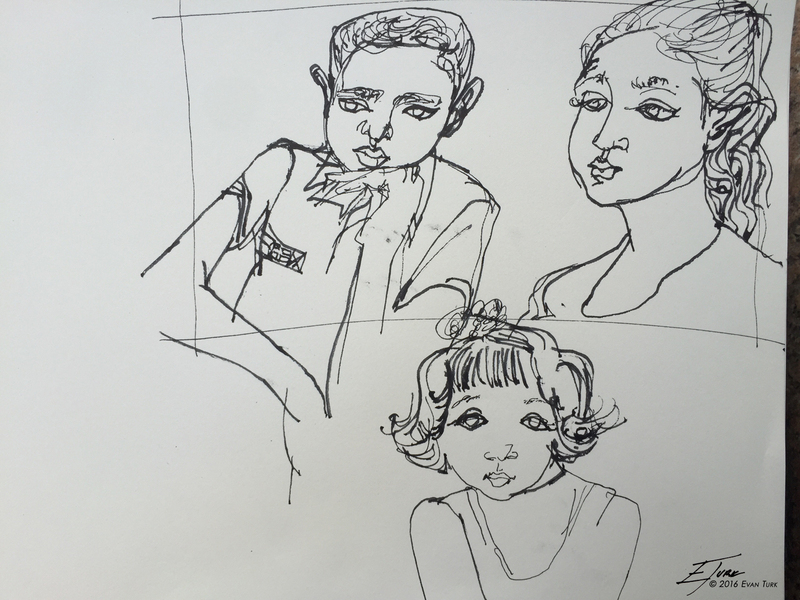 As his grandfather begins to illustrate the lesson, the monsoon clouds burst. 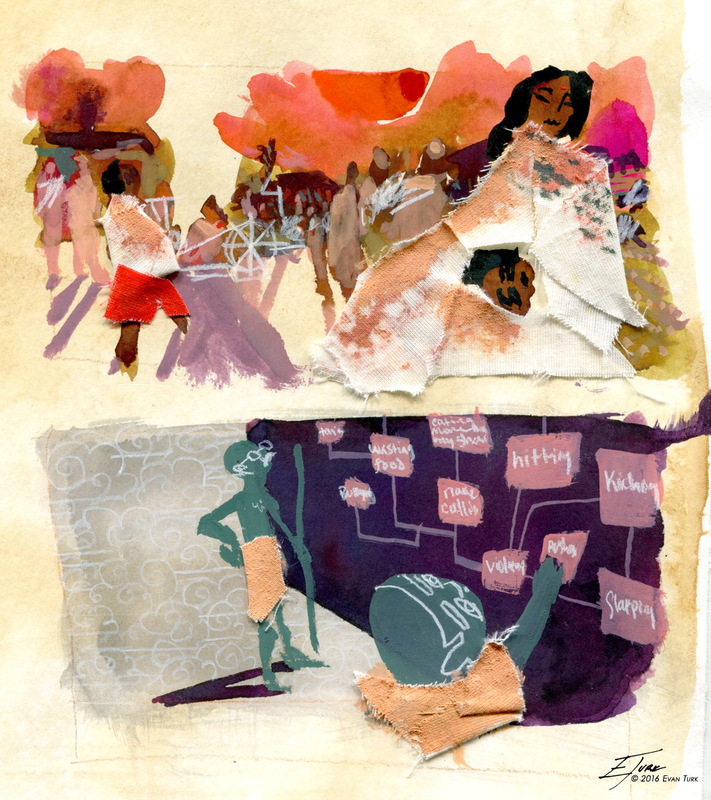 For the teaching scenes in the center of the book, I used a surreal, swirling background and color palette to emphasize Arun's dawning understanding. With the flooding of the monsoon, this sequence in the book was inspired by Indian miniature paintings depicting the infinite cosmic ocean. As Arun begins to comprehend the lesson, the colors begin to return to normal. And as Arun and his grandfather return to the ashram after it has been renewed with the monsoon rains, the bright colors return. 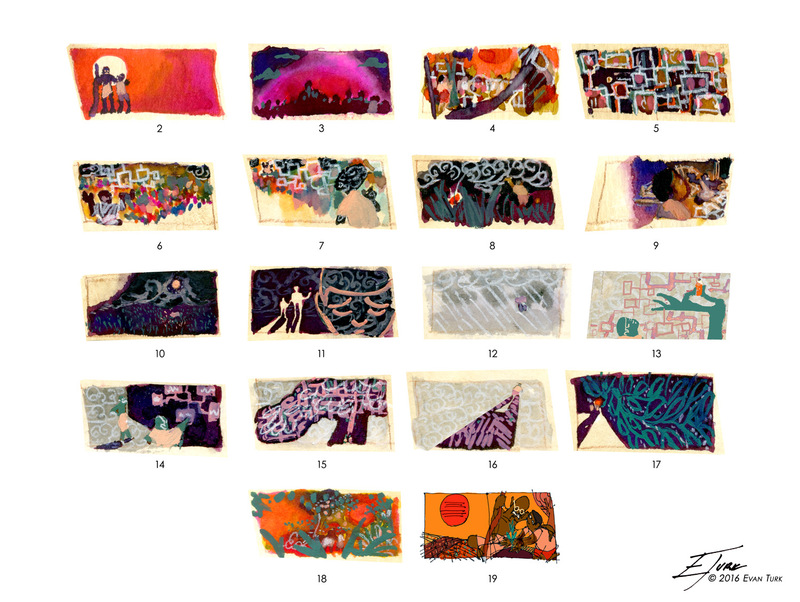 The whole book follows this arc of color, which you can see in these thumbnail sketches I used to plot out the color palette. Another aspect from the first book that I wanted to continue and build upon was the idea of thread. In the first book, the thread became an example of raw cotton being turned into something useful, in the same way that anger can be turned into useful energy. In this book, I expanded upon that idea by using the thread more and more as the book progresses, embroidered into the illustrations, as a way of showing how that channeled, useful energy begins to permeate everything around you. Inspired by the Kantha embroidered quilts of Bengal, I machine embroidered the pages with intricate patterns. Sewing the paper like cloth, the images become more and more embroidered as the book progresses. 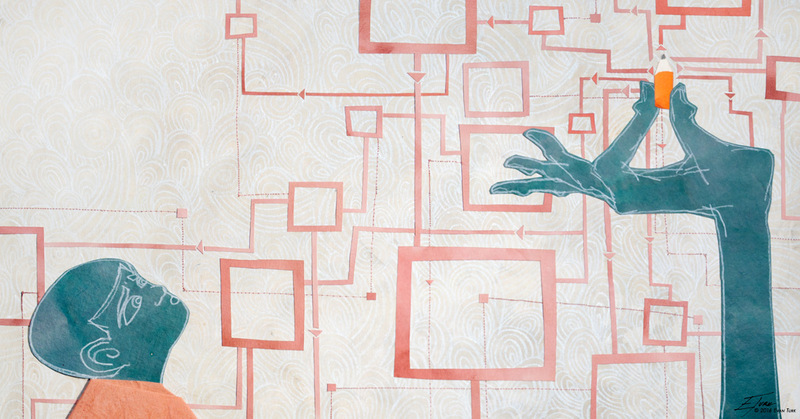 Once you realize that your actions affect everything around you, you can see that we, like patterns in a quilt, are all pieces stitched together in the same design. 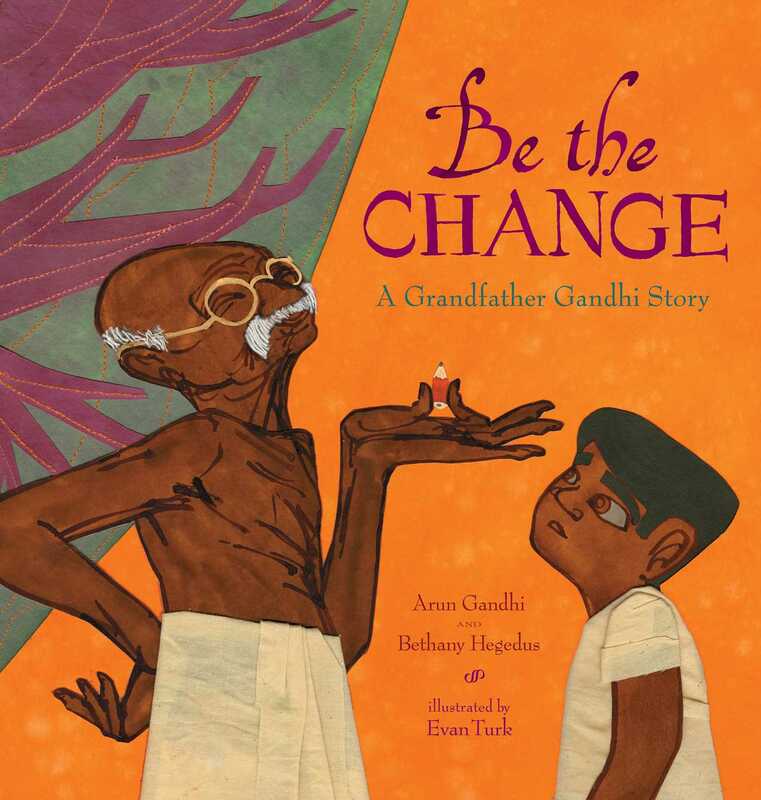 Be The Change: A Grandfather Gandhi Story is available wherever books are sold! It is a beautiful story, and I am very honored to be a part of it. Please check it out at your local independent bookstore, or use one of the links below.